Is this it? Is the bull market finished and the good times over? Well, they could very well be. We are looking at a world which is rotten to the core, a world which is built on debt which will never be repaid. And a debt which is artificially supporting $100s of trillions of assets and quadrillions if we include derivatives. The supposedly most powerful economy in the world (the US of course) is now so indebted that it needs to fight the whole world in all kinds of different wars for its survival, with the latest being a trade war. Whenever a nation starts fighting with other countries, it is always done from a position of weakness. US debt has been running out of hand for a long time. Federal, state, corporate, personal, mortgage, auto, student etc, etc, they are all escalating exponentially. On top of that the US budget deficit will be in the trillions for the foreseeable future and the trade deficit was $600 billion in 2017 and could soon be one more trillion dollar deficit. Starting wars is an Indication of the final stages of a troubled empire. The wars and interference in countries like Iran, Libya, Ukraine, Syria and Yemen are all part of that. The appointment of hardliner John Bolton as National Security Advisor as another perilous sign that the US is on the war path again. So is policing the world’s financial system and so is protectionism and trade wars. These are all desperate measures of a country in a terminal decline. And it is certainly not a coincidence that this trade war started right before the oil trading in Yuan begun. Eventually this will lead to the demise of the dollar and a major power shift from West to East as well as much higher gold prices. 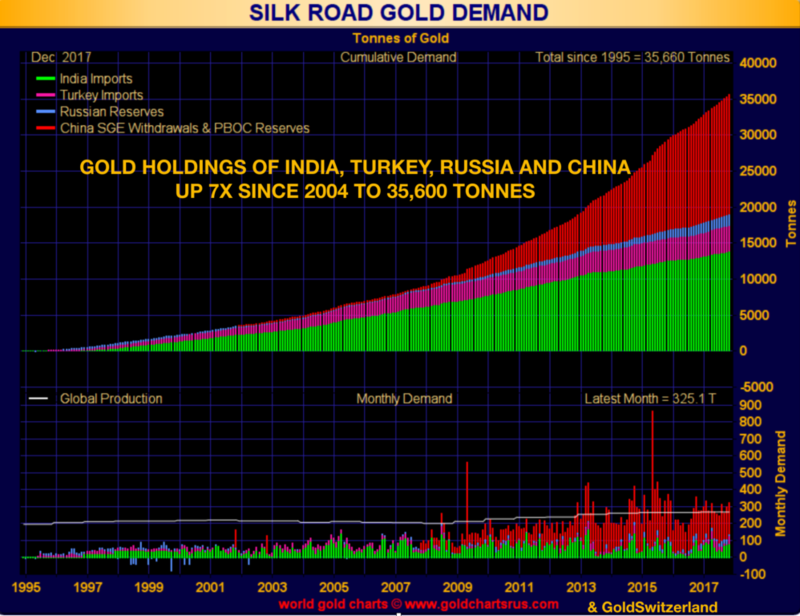 Nor is it a surprise that Silk Road countries have been buying major amounts of gold in this century. As the graph shows, the gold holdings of Russia, Turkey, India and China have increased 7 fold since 2004 from 5,000 tonnes to 35,600 tonnes. The question is how much is actually left in Western Central Banks of the 23,000 tonnes that they allegedly hold. The whole world is living above its means but the US is the worst culprit. So what is the US doing about it. Well there is no question of adjusting your spending in line with your expenses. That would be much too simplistic. Instead you blame the whole world that it is their fault and that they must be punished. And this is exactly what Trump is doing now. It is China’s and everybody else’s fault that a major part of US manufacturing has moved to low cost countries. And it is these countries’ fault that the US is living above its means and borrowing and spending more that it earns. Therefore these nasty countries must be punished. And that is the reason the US has started a trade war. Trade wars are almost without exception a desperate measure taken by an ailing economy. A trade war, especially between the two biggest nations in the world will indisputably lead to a downturn in world trade and therefore also a major global economic downturn. The desperate measures the US is currently taking reminds me of Richard Nixon in August 1971 when he blamed the whole world for the dollar being attacked. President de Gaulle of France was clever enough to see what was happening and asked for payment of the US debt to France in gold. Since the dollar was backed by gold, sovereign states could demand payment in gold at that time. With the US currency under pressure, Nixon abandoned the gold backing of the dollar on August 15, 1971. That was the beginning of the end for the US economy and also the world economy. A credit expansion and money printing bonanza started that has continued until this day. This has made a very tiny minority very rich and lumbered the rest of the world with a debt that they neither will nor can repay. But here is the important point. Trump’s desperate measure to save America will be seen as the nail in the coffin for the US and the world economy. And here we can draw a parallel to 1971. The US was in a similar situation then as it is now. Deficits were increasing and the dollar was falling. So what were the consequences of Nixon’s fatal decision. The dollar collapsed. I was in Switzerland at the time and saw the dollar fall 63% against the Swiss franc between Aug 1971 and January 1980. During that same period gold and silver surged. Gold went from $35 an ounce to $850 or up 24x. Silver went from £1.60 to $50, up 31 times. 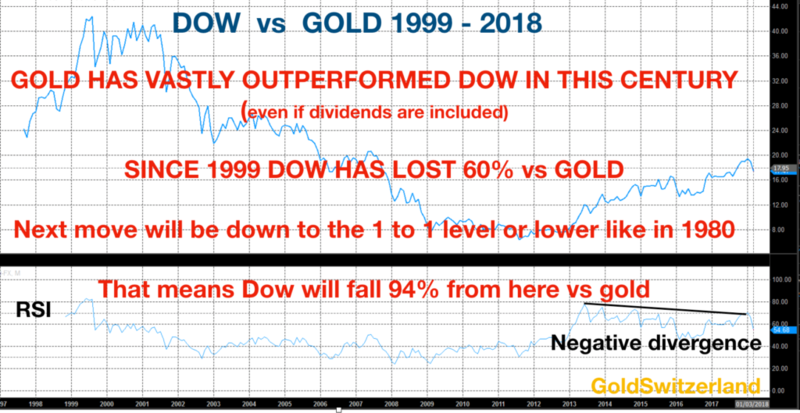 ACCELERATION OF GOLD AND SILVER TO $32,000 AND $500? Applying the same multiples, which means gold going up 24x from here, we would see $32,000 gold and with silver up 31x the silver price would be above $500.There could be lots of different arguments that it is different today and that the starting point is wrong etc. But in my view the starting point is very significant. Trade wars will have a major impact on all paper money and especially the dollar which is absurdly overvalued and only rests on debt. Not that any of the other major currencies are in a better position. So now we have an inflection point which will result in the dollar falling fast and gold and silver surging. The fragile and over indebted global economy only needed this last little snowflake to trigger the inevitable. The starting trade war will be blamed for the fall of the world economy. But that is of course not the case. Although trade wars and protectionism are a guaranteed conduit to trouble, it certainly will not be the cause of the coming disaster. It is only a catalyst for something which is totally inevitable. It is only a question which banking system will come under pressure first. We know that the Southern European banks are in a total mess which puts enormous pressure on the ECB and the biggest Eurozone bank, Deutsche Bank – DB. The price to book value of DB is now 38%. Clearly, the market does not believe that the assets are valued properly. How can they be with a derivative portfolio of EUR 47 trillion at least which is 15x German GDP. Clearly too big to fail but fail it most certainly will one day. But only after the ECB and Bundesbank have killed the Euro by printing unlimited amounts of the doomed currency and created hyperinflation. What is starting now, and will last for many years, is the biggest wealth destruction in history. It will come as a total shock to all investors who have been saved by central banks for decades. This time money printing will have no effect and although central banks will try to lower rates, it won’t work since they will lose control of the debt market and interest rates will go to at least the levels in the 1970s and early 1980s of high teens or even a lot higher as debtors default. So the coming crisis can be directly compared to the 1970s after Nixon took away the gold backing of the dollar. I moved to the UK in 1972 and remember the effect on the economy. There were price and wage controls (which failed), there was fuel rationing, there was a coal miners’ strike and a three day week which means that shops and offices only had electricity for three days. Stocks crashed – I had my first options in the company I worked at £1.30 in 1972 and 1974 the share price was at 10 pence. The company was doing well but the market collapsed. The interest rate on my first mortgage was 21% for a period. How many would cope with that today. Many European countries have around 1% mortgage rate. So stocks crashed in the 1970s and so did the pound and the dollar and gold surged as I described above. The advantage of having a long life behind you is that experience teaches you a number of lessons. Very few investors or ordinary people who live and work today have the experience of a severe downturn. The legendary Richard Russell (Dow Theory Letters) talked about the depression which he lived through in New York. That experience was invaluable for his incredible wisdom in markets, investing and life. What happened in the 1970s have many similarities with today. Most people will argue that it is different today. But those people lack the necessary experience of a long life and critical events. In my article of March 9, I forecast that stocks had topped and that a dollar crash and surge in the precious metals was imminent. All of that is now on track. We are now at the eve of a major pivotal change in the world economy which will make life very difficult for most people. For the very few who have assets to protect, now is the time to get out of all bubble assets as I have been recommending for some time. It is also the time to own physical gold and silver for insurance and wealth protection purposes. Precious metals will go to the levels indicated above and most probably a lot higher as hyperinflation sets in. 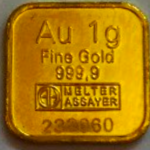 And for the great majority who don’t have major funds to protect, remember that you could save say 1 gram of gold per month, or more, which today costs $43. Over time regular saving of that magnitude can create an important nest egg. But everyone must remember that your most important support will be a close circle of family and friends. In a crisis this is absolutely critical.